Genesal performs more than 600 commissioning processes every year, of which most are outside of Spain. 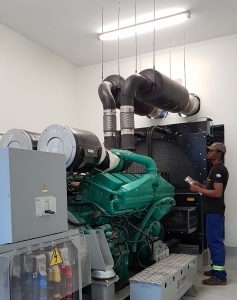 Making sure that oil, fuel and coolant levels are optimal, that the air inputs are correct or that the unit has arrived to its destination in the same conditions in which it left the factory, are just some of the technical protocol steps to be performed before the commissioning of any generator set, in a fully comprehensive and absolutely essential check-up coordinated by Genesal Energy’s Guillermo Docampo, thanks to an expertise acquired through 40 years of experience in the energy industry. Since the founding of Genesal almost 25 years ago, Docampo and the rest of the engineers in the testing team know every unit that is designed and built in the factory inside and out, because their job is precisely that, making sure nothing fails, and making sure that the generator that a client purchases, which is created according to their specific needs, is in perfect conditions before definitively handing it over to the client. “Our service is akin to that of the MOT, we’re the ones that give the go-ahead”, he says. Commissioning is, therefore, fundamental in order to avoid subsequent issues, to minimize and eliminate risks. While with standard generator sets– like those designed to provide power for a farm or a hotel – the steps prior to a successful start-up are relatively simple, in the case of special generators (nuclear plants, hospitals or combined-cycle plants, amongst other installations) the situation is completely different due to the nature of the unit. While with standard units it’s quite normal for the After Sales department to assume this task – “a good instruction manual and some basic notions are, in most cases, enough”, the expert states – in the case of special generator sets, the protocol is different: “A Genesal team or a group of technicians that have received training by our staff always travel to the area”, Guillermo Docampo points out. At a global scale, the number of commissioning processes performed by Genesal Energy exceeds 600 a year, which means an average of two a day, although the percentage varies greatly according to the world map. On a national level, 30% of Genesal Energy’s services include commissioning, however this percentage is much higher in the international market, where in countries like Peru they now represent 95%. In reality, the nature of the generators that are sold outside of Spain (many of them special generators) explain thishigh number of commissioning processes. “It’s always convenient that the start-up and supervision processes are taken out by the manufacturing company because we and our service technicians know the product better than anyone”, says Docampo, who throughout his career has taken Genesal’s energy to more than 40 countries. Columbia, Ecuador, South Africa, Ghana, Saudi Arabia, Georgia or Qatar are part of thewide client portfolio of the company, where the commissioning service always tends to be included. Without a doubt, training is a basic tool when it comes to commissioning processes, so that the supervision and control tasks that these check-ups require take place with total guarantee. This way, Genesal provides an average of four courses a year in its headquarters in Bergondo (A Coruña), although its programmes also include training plans and sessions abroad, giving classes to the personnel that will be in contact with the generator set or will be in charge of its maintenance tasks. “The courses are absolutely necessary in order to have a thorough knowledge of the unit and, therefore, to make sure that everything is okay. We need to guarantee the operation of the generators in times of emergency and in order to achieve this, a good maintenance of the unit is fundamental, which is why adequate training is needed”, Docampo highlights.